Source: This review was written for LibraryThing Early Reviewers. Cara's mother has disappeared. Her father isn't talking about it. Her big brother Max is hiding behind his iPod, and her genius little brother Jackson is busy studying the creatures he collects from the beach. But when a watery specter begins to haunt the family's Cape Cod home, Cara and her brothers realize that their scientist mother may not be who they thought she was—and that the world has much stranger, much older inhabitants than they had imagined. Packed with memorable characters and thrilling imagery, Lydia Millet weaves a page-turning adventure even as she brings the seaside world of Cape Cod to magical life. 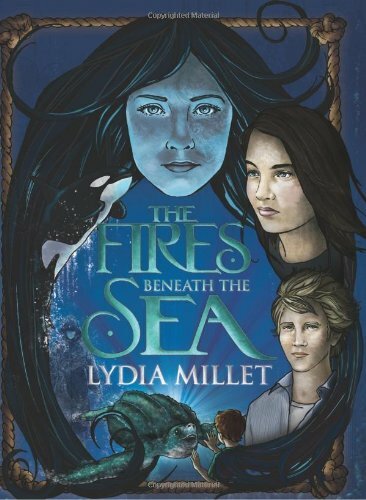 The first in a series of books about the Sykes children, The Fires Beneath the Sea is a rip-cracking middle-grade novel that will make perfect beach reading—for readers of any age! I read several reviews that alluded to this being similar to A Wrinkle in Time. I could see some similarities but not that many. This was a wonderful story of three children on a quest to help their mother. They are given bits and pieces of the puzzle as needed. I found myself not wanting to put the book down. I found after reading about the “Pouring Man” that I had trouble going to sleep. It might have something to do with the fact it was raining outside and it was nighttime. That parallel was enough to scare anyone. I had a little difficulty getting into the book at first. When I hit the place about 25 pages in where we first meet the “Pouring Man” I knew I was hooked. I had to find out who he was and what he wanted. I had a student who had started this book at the end of school and was upset because I wouldn’t let him read it over the summer. Now I know why. I will definitely let him read it when school starts. This is definitely a book for anyone who likes fantasy that has that spooky element that makes you feel creeped out.